The 2006 Pacific typhoon season was a near-average season that produced a total of 23 named storms, 15 typhoons, and six super typhoons. The season ran throughout 2006, though most tropical cyclones typically develop between May and October. The season's first named storm, Chanchu, developed on May 9, while the season's last named storm, Trami, dissipated on December 20. Also, this season was more active, costly, and deadly than the previous season. Throughout the season, many typhoons made landfall at a higher intensity. Typhoon Saomai was the most powerful typhoon to strike China for over 50 years, as a Category 4 typhoon, responsible for over 400 deaths. Typhoon Shanshan struck Japan and became the costliest typhoon this season with a total damage of about $2.5 billion. The Philippines got hit by a total of six typhoons, which saw the highest number since 1974. All six typhoons were responsible for over 1,000 casualties and several millions of damages. 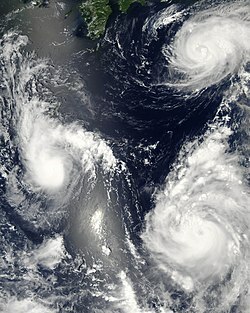 Typhoon Ioke, which formed from the Central Pacific, entered the basin and became the strongest Central Pacific hurricane. Moreover, it was stated that the ratio of intense typhoons was 0.73, which was the highest since 1970. During the year several national meteorological services and scientific agencies forecast how many tropical cyclones, tropical storms, and typhoons will form during a season and/or how many tropical cyclones will affect a particular country. These agencies included the Tropical Storm Risk (TSR) Consortium of University College London, PAGASA and Taiwan's Central Weather Bureau. Some of the forecasts took into consideration what happened in previous seasons and the La Niña conditions that were observed during the previous year. On March 7, Tropical Storm Risk issued its first forecast for the season at an extended-range, forecasting a close to average season of 27 tropical storms, 17 typhoons and 8 intense typhoons. The ACE predicted was around 298. By May 5, Tropical Storm Risk issued their second forecast for the season, raising their numbers to 29 tropical storms, 19 typhoons and 9 intense typhoons, with an ACE of 326. This is due to the observed warming of sea-surface temperatures in the Niño 3.75 region and current patterns within the Central Pacific, indicating slightly higher activity. TSR released its third forecast for the season on June 7, predicting the same numbers with the same reason. Though on their fourth forecast during July 5, TSR stated that the 2006 season will be 15% above the 1965–2005 norm. Therefore, they raised the number of intense typhoons to 10, and their ACE to 349. The other reason behind this is due to the fact that there was an increase in tropical activity and much warmer SSTs over in the Niño 3.75 region than the previous forecast. On August 4, TSR released their final forecast. They reduced the number of intense typhoons to 9, and the ACE to 325. This was because it was reported that a slight decrease in tropical activity from the previous forecast and is due solely of a slight decrease in SSTs over in the same region. The Pacific typhoon season runs throughout 2006 and has no official bounds, though most tropical cyclones from this basin generally develops from the months from May through to October. Despite the season turned out to be active, most tropical cyclones developed during the second half of the year, with only one typhoon, Chanchu developing during the month of May. Some minor systems also developed before May, with the first tropical system of the year, Agaton, developing to the east of Philippines on January 20, bringing minor damages as it crossed the country few days later. Tropical cyclogenesis had become much favorable during late June with formations of Jelawat and Ewiniar. It was also during the same time when NOAA had stated that the weak 2006–07 El Niño had started. From mid July to early August, three "back-to-back" storms made landfall over in China, which were Bilis, Kaemi and Prapiroon. With all three combined, more than 900 people have been dead and damages were reported more than US$5 billion. Shortly thereafter, environments throughout most of the basin became favorable with less shear, more convection and warmer water, as three simultaneous storms, Maria, Saomai and Bopha, formed and affected three different landmasses such as Japan, China and Taiwan, respectively. Later in the same month, Hurricane Ioke had entered the basin from the Central Pacific as the strongest Central Pacific storm in recorder history, as a Category 5 powerful storm. On September, an unnamed and unclassified tropical storm have been discovered by meteorologist Gary Padgett and Dr. Karl Hoarau. Later, Typhoon Xangsane affected Luzon, Philippines, causing major damages with more than 200 people dead. The country saw four storms making landfall, with three of them reaching Category 4 or 5 super typhoon status. Typhoon Cimaron made landfall over in northern Luzon as a Category 5 super typhoon with minimal damages. By November, Typhoon Chebi made landfall in the same area as Cimaron, though effects from the typhoon were much smaller than Cimaron. Although by late November, Typhoon Durian made landfall in Bicol region. Combined effects with ash from the Mayon Volcano had killed over 1,500 people and damages at least US$530 million. Durian also crossed the basin and into the North Indian Ocean basin, the first time since 2003. During early December, two systems formed. Typhoon Utor crossed Visayas with minimal damage; and Tropical Storm Trami, a very weak system that didn't affect any landmasses became the final tropical cyclone and dissipated on December 20. On January 20, the JMA began monitoring a minor tropical depression located about 555 km (345 mi) east of Mindanao in the southern Philippines. As it traveled in an erratic northwestward direction, it slowly became better organized. On January 23, the JMA assessed the storm to have attained winds of 55 km/h (35 mph 10-minute winds). Around the same time, PAGASA began issuing advisories on the system and gave it the local name Agaton. The depression weakened as it crossed over northern Samar Island and southern Luzon. Traveling towards the west, the system failed to strengthen and dissipated on January 27 while located over the South China Sea, about halfway between Vietnam and Borneo. On March 4, a tropical depression formed out of a wave close to the equator southeast of Palau. The JTWC upgraded it to Tropical Storm 01W at 3 p.m. UTC the same day. The JTWC downgraded it back to a depression on March 5 due to shear, and it never regained tropical storm strength before dissipating on March 7. On May 8, the JMA started to track a tropical depression about 175 km (110 mi) northeast of Palau, and later the JTWC followed suit giving the designation of 02W. By the next day, 02W had intensified into a tropical storm, with the JMA naming it Chanchu. The PAGASA had also declared that Chanchu had entered their area, giving the local name Caloy. Chanchu reached typhoon intensity and made its first landfall over in Samar on May 11, and several hours later, it struck Mindoro at Category 2 typhoon intensity. As Chanchu emerged to the South China Sea, and moved northward, the storm explosively intensified into a Category 4 typhoon and reached peak intensity with 10-minute sustained winds of 175 km/h (110 mph) on May 15. By May 17, Chanchu rapidly weakened into a severe tropical storm as it made its landfall over in Shantou, Guandong. Both the JMA and the JTWC issued its final advisory on May 18 as it became extratropical. In the Philippines, the storm caused 41 deaths and a total of ₱117.6 million (US$2.15 million) in damage. Though Chanchu didn't made landfall over in Vietnam, several ships sunk and were lost. A total of 18 people, who are fishermen, were dead. Chanchu is also the most intense typhoon on Hong Kong Observatory's record to enter the South China Sea in May. Chanchu necessitated the Strong Wind Signal no. 3 in both Hong Kong and Macau. In Hong Kong, the Gale force signal 8 should have been hoisted for at least 10 hours as sustained gales were affecting the Eastern part of the territory, where the hourly mean wind reached 83 km/h, with gust reaching over 100 km/h in some areas. Overall damage in China was at ¥7 billion (US$872 million). On June 24, the JMA started to track a weak tropical depression located to the southeast of Samar, Visayas. After crossing the archipelago, as it emerged to the South China Sea on June 26, the PAGASA named it Domeng while the JTWC had started issuing advisories with the designation of 03W. Moving northwestward, 03W had entered in an area of favorable environments and intensified into a tropical storm, with the naming of Jelawat on June 27. Jelawat made landfall over Southern China and fully dissipated inland on June 29. The storm dropped heavy rainfall across southern China and Haikou recorded a rainfall of 309.7 mm (12 inches) during the storm passage. A total of 8.6 inches (220 mm) rain fell in 16 hours in Kampung Bundu, Malaysia. The rainfall killed seven people and left one missing. The flooding from Jelawat ruined 200 square kilometres of farmland and destroyed 190 houses. On June 29, a persistent tropical disturbance was classified as a tropical depression by the JTWC while east of Palau. The depression moved northwestward and was upgraded to Tropical Storm 04W by the JTWC on June 30. The JMA designated the storm Tropical Storm Ewiniar at around the same time. The name "Ewiniar" was submitted by the Federated States of Micronesia, and refers to a traditional storm god of Chuuk. Ewiniar was responsible for at least 30 deaths in China, which it brushed as a typhoon. The typhoon gradually weakened as it moved over colder waters, and made landfall in South Korea on July 10 as a severe tropical storm. As Ewiniar moved across the country, it passed within 30 miles (48 km) of Seoul. The storm brought heavy rain that triggered floods and mudslides in the southern part of the country, killing at least six people. Ewiniar became extratropical over the Sea of Japan on the same day. A tropical disturbance northeast of Yap developed sufficient convection to be designated a tropical depression on July 8. The depression strengthened into a tropical storm the next day, and was designated Tropical Storm Bilis by the JMA. The word "Bilis", submitted by the Philippines, means speed or swiftness. PAGASA operationally treated this storm as a typhoon for a short time on July 13, but it officially remained a tropical storm as it moved west-northwestward toward Taiwan. After moving over northern Taiwan, Bilis made landfall in Fujian, China at 12:50 p.m. CST on July 14, weakening into a tropical depression inland the next day. JMA carried the system as a tropical depression until July 17. Bilis brought very heavy rain, widespread flooding, landslides, and strong winds to the Philippines, Taiwan and areas of mainland China, causing 672 deaths and $4.4 billion (2006 US$) in damage. A tropical depression formed on July 18 near the Caroline Islands, it quickly strengthened to tropical storm strength the same day. On July 19, the storm was named Kaemi by the JMA. The correct name Gaemi was submitted by South Korea and is a Korean word for ant. It strengthened into a severe tropical storm on July 20, and further deepened into a typhoon 24 hours later. Kaemi made landfall in Jinjiang, Fujian at 3:50 p.m. CST on July 25 as a minimal typhoon. Heavy rainfall in Taiwan caused flooding and four minor injuries. Rain also fell heavily in the northern Philippines. The storm has also killed at least 32 people in China, while another 60 people are missing. Agricultural losses in Taiwan amounted to NT$73 million (US$2.2 million). Total damages from the storm amounted to $450 million. PAGASA named a system east of the Philippines as Tropical Depression Henry later on the same day that the JMA recognised it as a tropical depression on July 27. The JTWC upgraded this system to a tropical storm on the morning of August 1. Hong Kong Observatory also did so and issued the Tropical Cyclone Signal No. 1 that same afternoon, and shortly after the JMA upgraded the system to Tropical Storm Prapiroon. The name Prapiroon was submitted by Thailand and is the name of a Thai rain deity. The JMA upgraded the storm to a severe tropical storm on the morning of August 2. PAGASA ceased advisories on the storm shortly after as it moved out of its area of responsibility. The JTWC and the HKO upgraded Prapiroon to a typhoon at 3 a.m. UTC, while the JMA officially upgraded it to a typhoon at 12 p.m. UTC (8 p.m. HKT). Prapiroon necessitated the first Tropical Cyclone Signal No. 8 in Macau this year. In Hong Kong, the flag raising ceremony at the Golden Bauhinia Square was cancelled due to strong wind. Prapiroon made landfall at 7:20 p.m. CST on August 3. The strong winds due to the storm resulted in 70% of flights being cancelled, delayed or diverted in the Hong Kong International Airport, the highest since the opening in 1999. However, the airport remained open throughout the storm passage and many flights successfully landed or took off on August 3. Inbound flights were rerouted to nearby airports and outbound flights were cancelled or postponed. On landfall in Guangdong province, China, it forced the evacuation of some 660,000 people and caused an estimated 5.4 billion Chinese yuan worth of damage. 77 people were reported killed. It also affected Hunan, Guangxi and Hainan. Prapiroon degenerated into an area of low pressure on August 6. Maria formed out of a tropical depression over the open waters of the western Pacific Ocean. On August 5, the JMA classified the depression as a tropical storm while the JTWC kept it as a depression. The storm quickly strengthened into a typhoon the next day, reaching its peak intensity with winds of 130 km/h (80 mph) early on August 6. The storm gradually weakened as it began to recurve, causing it to parallel the southeastern coast of Japan. On August 9, Maria weakened into a tropical depression and later into an extratropical cyclone before dissipating on August 15. Maria had only minor effects in Japan, mainly heavy rains which were estimated to have peaked over 400 mm (15.7 in) on the Izu Peninsula. One person was killed after being struck by lightning and six others were injured. The JTWC identified a tropical depression near the Caroline Islands late on August 4 UTC. The JMA designated it as such at 12 a.m. UTC August 5. Nine hours later, the JTWC upgraded Tropical Depression 08W to a tropical storm, three hours before the JMA named it Saomai. The name is from the Vietnamese "sao Mai", meaning "Morning Star", a reference to the planet Venus. The JTWC designated it a typhoon at 3 p.m. UTC August 6. The JMA upgraded Saomai to a Severe Tropical Storm at 6 p.m. UTC, and as it continued to strengthen, it was upgraded to a typhoon just 12 hours later. Saomai passed into the Area of Responsibility of PAGASA on August 8 and was named Typhoon Juan by PAGASA. On August 8, the storm underwent explosive development, and by August 9 it had become a Category 5-equivalent super typhoon. Saomai made landfall in Zhejiang, China on August 10 with maximum sustained winds of 115 knots (1-minute mean), stronger than Chanchu earlier this season. Saomai was responsible for at least 458 deaths, mostly in China, and $2.5 billion (2006 USD) in damage. The JMA identified a tropical depression in the open Pacific on August 5. PAGASA named this storm late on August 5 as it was forecast to enhance the southwest monsoon and bring rains to the Philippines. Around 1800 UTC, the JTWC declared that the system had developed into a tropical depression and gave it the number 10W. JMA upgraded it to Tropical Storm Bopha on August 6. The name Bopha was submitted by Cambodia and is a flower and girls' name. Around this time, the JTWC also upgraded the system to a tropical storm. The JTWC recognised its existence as a tropical depression at 9 a.m. UTC the same day before upgrading it to a tropical storm at 3 p.m. UTC. The JMA then upgraded it to a severe tropical storm as it slowly churned westwards at 12 a.m. UTC August 7 before downgrading it 18 hours later. Bopha unexpectedly restrengthened into a severe tropical storm at 3 a.m. UTC August 8, before weakening back to a tropical storm at 12 p.m. UTC. Bopha later made landfall on Taiwan at about 2 a.m. local time on August 9. At this time, the JTWC reported that Bopha attained winds of 100 km/h (65 mph). Tropical Storm Bopha then weakened into a tropical depression before degenerating into a remnant low on August 10. The outer bands of Tropical Storm Bopha produced heavy rains over northern Luzon, triggering flooding that destroyed 1,200 homes and killed seven people. Two of the fatalities occurred after a home was destroyed by a landslide in Kalinga Province. The landslide damaged 20 other homes, a church and a school. As Severe Tropical Storm Bopha approached the island on August 8, the meteorological agency in Taiwan issued land and sea warnings for most of the region. Residents were warned about the possibility of torrential rains, flooding and mudslides. Although the storm was forecast to directly impact the island, all businesses remained open and schools were not closed. In Hong Kong, the Hong Kong Observatory issued Standby Signal number one as Bopha came within 800 km (500 mi) of the city on August 9. This signal was later discontinued on August 11. Between August 9 and 10, the remnants of Bopha produced moderate rainfall around Hong Kong, peaking at 45.6 mm (1.80 in). Wind gusts up to 110 km/h (70 mph) were also produced by the storm throughout the city. A storm surge of 0.48 m (1.6 ft) was recorded in Tai Po Kau on August 8. Tropical Depression 11W formed south of Iwo Jima on August 12. Early on August 13, as it moved to the north-northwest, the JTWC upgraded it to a tropical storm. The JMA named it Wukong later that day. Wukong was submitted by People's Republic of China, and it is the name of a character in a Chinese epic. Wukong absorbed Tropical Storm Sonamu shortly before landfall in Japan. Wukong then stalled over Kyūshū, before starting to jog to the north-northwest. It was downgraded to a tropical depression on August 20. In post-operational analysis by the JMA, Wukong was upgraded to a severe tropical storm. On August 13, a tropical depression formed south of Naha, Okinawa, and was named Katring by PAGASA and Sonamu by JMA. The name Sonamu was submitted by DPR Korea and signifies a pine tree. Sonamu began interacting with nearby Tropical Storm Wukong on August 15, with the outflow from the stronger Wukong producing unfavourable shear over the cyclone. The JMA declared the system a tropical depression and stopped issuing advisories on August 16. The JTWC followed shortly after. In the afternoon of August 23, the China Meteorological Administration declared the formation of a tropical depression near Hainan. Hong Kong Observatory followed later that afternoon. The depression necessitated Tropical Cyclone Signal No.1 in Hong Kong and Macau, which means that the centre of a tropical cyclone is within 800 km (500 mi) of the respective Special Administrative Regions, and may later affect them. The depression made landfall at Guangdong at 5:55 a.m. CST on August 25 and dissipated later that morning. The JTWC designated the system as a Tropical Depression at 9 p.m. UTC August 24, but only issued two warnings on the system. On August 27, Hurricane Ioke, which had formed in the Central Pacific, crossed the International Date Line and entered the Japan Meteorological Agency's Area of Responsibility at around 6 a.m. UTC, keeping its name while being reclassified as Typhoon Ioke. Ioke had earlier affected Johnston Atoll. On August 31 the center of the typhoon passed very close to Wake Island; 200 people were evacuated from there in advance of its approach. Typhoon Ioke then passed just to the northeast of Minami Torishima, which had been evacuated ahead of the storm, but as a weakened Category 3-equivalent typhoon. Ioke then turned to the northeast, weakening as it started undergoing extratropical transition. The JMA released its final advisory on September 7. The extratropical remnants of Ioke moved into the Bering Sea where it caused severe beach erosion along the western Alaskan coastline. In early September, a tropical disturbance developed near Wake Island and gradually developed. Though never officially warned upon by any agency, meteorologist Gary Padgett and Dr. Karl Hoarau of Cergy-Pontoise University surmised that the system likely was a tropical cyclone. Dr. Hoarau estimated that the system became a tropical depression early on September 5 and tracked north-northeast, attaining tropical storm intensity 18 hours later. Around that time, the system featured a well-defined low-level circulation, significant convection wrapping around the circulation, and excellent outflow. Additionally, a QuikScat pass revealed estimated surface winds of 95 km/h (60 mph). Around the time Dr. Haorau classified it a tropical storm, the JTWC issued a Tropical Cyclone Formation Alert and their satellite intensity estimates reached T2.5, indicating a minimal tropical storm. On September 6, the system began to weaken as it turned north-northwest. Convection became intermittent, flaring around the circulation, and Dr. Haorau estimated it weakened to a depression later that day. Continuing northward, the system moved into a region of cooler waters and higher wind shear, inhibiting redevelopment. By September 9, the system became more extratropical in nature and was last noted by the JTWC at that time. Hong Kong Observatory identified a tropical depression about 460 kilometres north of Yap on September 9, the same day the JMA recognised it. The JTWC declared the formation of Tropical Depression 14W the next day. On the afternoon of September 10, it entered the PAGASA AOR and was named Luis. Later at 12 p.m. UTC on the same day, the JMA upgraded the tropical depression to Tropical Storm Shanshan. The name Shanshan was contributed by Hong Kong and is a girls' name. Shanshan quickly strengthened and was upgraded into a severe tropical storm on September 11 and a typhoon later that day. Shanshan weakened slightly on September 14, but quickly restrengthened and reached Category 4 status on the JTWC's scale. Shanshan passed through the Yaeyama Islands in the early morning hours of September 16. The JTWC reported that Shanshan was becoming extratropical early on September 17, as the typhoon weakened to a tropical storm. The JTWC issued its final advisory on Shanshan later that day, and the JMA issued its last advisory on September 18, after Shanshan completed extratropical transition. As Shanshan neared Taiwan, the Central Weather Bureau and local officials warned of flooding and high winds. However, as Shanshan turned towards Japan, all warnings were cancelled. South Korean forecasters also issued warnings ahead of an expected landfall, but this did not materialise. Ships were diverted as ports were closed as a precaution, while some other boats were forced to remain docked. In Japan, more than 90,000 people were evacuated from Yamaguchi Prefecture. Over 200 people were injured by Shanshan and 11 people were killed, mostly in Kyūshū, although two deaths were reported in South Korea. A tornado spawned by the typhoon caused a train derailment in Nobeoka, Miyazaki, Japan which caused no fatalities. Peak gusts on Iriomote reached 155 mph (248 km/h). Flights and trains were delayed, while electricity was cut to about 3000 homes in Korea. A ship also sank off Ulleungdo. Hong Kong Observatory identified a tropical depression about 360 kilometres east-northeast of Xisha on September 12 and issued Standby Signal No.1 accordingly. The tropical depression also necessitated the issuance of the Standby Signal No. 1 in Macau at 2 p.m. UTC on the same day. The JTWC designated it as a tropical depression, 15W, at 9 p.m. UTC September 12. The JMA had earlier already identified it as a tropical depression. As it strengthened and edged closer to the coastal areas of Guangdong, the Strong Wind Signal No. 3 was issued both in Hong Kong and Macau on September 13. It made landfall in western Guangdong around 11:30 p.m. CST that night and dissipated inland. The Joint Typhoon Warning Center identified an area of disturbed weather northeast of Chuuk on September 13. The disturbance drifted to the north over the next few days, gradually increasing in organization. The JTWC issued a Tropical Cyclone Formation Alert on the disturbance on September 16, and both the JTWC and JMA declared the system a tropical depression early on September 17. The JMA upgraded it to Tropical Storm Yagi later that morning as it moved erratically through the open Pacific Ocean, and the JTWC soon followed suit. The name Yagi was submitted by Japan and means Capricornus (goat). Yagi was upgraded to a severe tropical storm by the JMA on September 18, and the JTWC designated it a typhoon later that day. The JMA officially upgraded Yagi to typhoon status early on September 19. Yagi was upgraded briefly to a super typhoon by the JTWC from September 21 to 22. On September 23, the JTWC reported that Yagi was becoming extratropical as it continued to weaken, and issued its final warning the next day. The JMA downgraded Yagi to a severe tropical storm on September 24. It was the third tropical cyclone in the NW Pacific Basin that attained Category 5 status in 2006. It started to recurve near Chichi-jima, and never affected major land areas. It became extratropical near the western Aleutians on September 25. Its extratropical remnants crossed the basin on September 27. The China Meteorological Administration (CMA) and Hong Kong Observatory both identified a tropical depression in the southern South China Sea on September 22. The system was organized enough to be classified as Tropical Depression 17W by the JTWC the next day. It weakened under heavy vertical wind shear and the JTWC issued its final advisory on Tropical Depression 17W before landfall in Vietnam. The storm passed just south of Hainan and brought heavy rain to the area. The maximum rainfall recorded was 143 mm. CMA kept it as a tropical storm until it made landfall in Vietnam in the morning of September 25. On September 25, the Philippine Atmospheric, Geophysical and Astronomical Services Administration (PAGASA) named an active low pressure area within its area of responsibility Tropical Depression Milenyo. After issuing a Tropical Cyclone Formation Alert earlier, the Joint Typhoon Warning Center issued its first warning on Tropical Depression 18W. On September 26 the Japan Meteorological Agency named this system Xangsane. The name Xangsane was submitted by Laos and means elephant. Later that day, the JMA upgraded Xangsane to a severe tropical storm. A bout of rapid intensification followed, and all three agencies, the JMA, JTWC and PAGASA all upgraded the storm to a typhoon late on September 26 or early September 27. Xangsane made landfall on Samar Island as a severe tropical storm. The typhoon dropped heavy rainfall in the Philippines. To avoid the storm, transit authorities kept seacraft at several ports in the archipelago, leaving over 3,500 passengers stranded. Xangsane also prompted Philippine officials to close all schools, financial markets, and government offices in and around Manila. The typhoon killed over 200 people in the country, and produced strong winds and rainfall, downing power lines and causing mudflows. The strong winds caused moderate crop damage totaling to $7.2 million (2006 USD). Xangsane made landfall as a typhoon near Huế early on October 1. The JTWC stopped issuing advisories soon after, and the JMA downgraded it to a severe tropical storm. Xangsane killed 71 in Vietnam. On October 1, a persistent area of low pressure just east of the Philippines developed into Tropical Depression 19W. The JMA had already been monitoring the storm. It was named Neneng by PAGASA, and later that evening was upgraded to a tropical storm by the Philippine authorities. The JMA and JTWC both designated the storm a tropical storm the next day, and it was named Bebinca by the JMA. Bebinca is a type of Macanese milk pudding. The JTWC downgraded it to a tropical depression briefly between October 4 and 5 as wind shear took its toll. Its low-level circulation then became exposed with dry air entering the system, and both the JMA and JTWC declared the storm as a dissipating tropical depression on October 6. It soon became entrained within the circulation of a storm-force extratropical low, which swept across the Honshū coastal waters and led to 33 people dead or missing. It was upgraded to a severe tropical storm in post analysis. On October 3, a tropical depression south of Minami Torishima in high sea-surface temperatures gained enough convection and was designated Tropical Storm Rumbia by the JMA, although the JTWC had not even carried it as a tropical depression. Later that day, the JTWC issued a Tropical Cyclone Formation Alert, and began warnings on Tropical Depression 20W the next day. Rumbia slowly began to intensify while moving to the northwest, but on October 6 its low-level circulation became fully exposed, and the JTWC issued a final warning. The JMA followed suit soon after. The remnants of Rumbia later became extremely elongated on October 6, before being absorbed into the large extratropical low of Bebinca. The name "Rumbia" comes from a type of palm tree known as the sago palm. On October 6, a tropical disturbance formed about 240 km (150 mi) north-northeast of Kwajalein with convection nearby, developing a low pressure area two days later. On October 8, the JMA began monitoring the system as a tropical depression, upgrading it to Tropical Storm Soulik the next day, while the JTWC classified it as Tropical Depression 21W. An anticyclone to the north and a tropical upper tropospheric trough cell to the west provided outflow for the system. Soulik tracked northwestward around a ridge, slowly intensifying due to wind shear in the region. Around 1200 UTC on October 10, the JTWC upgraded Soulik to a typhoon, and the JMA followed suit late on October 12. Another ridge west of Soulik turned the storm northward, and the influence of both ridges caused Soulik to become nearly stationary about 100 km (65 mi) south-southwest of Iwo Jima. According to the JTWC, Soulik attained 1 minute winds of 165 km/h (105 mph) while the JMA reported 10 minute winds of 140 km/h (85 mph). At 0600 UTC on October 14, Soulik passed within 40 km (25 mi) of Iwo Jima. According to the JTWC, this would place the island within an area affected by typhoon-force winds. Later that day, an approaching trough increased the wind shear, causing the typhoon to weaken. By 1200 UTC on October 16, Soulik had transitioned into an extratropical cyclone as it rapidly traveled towards the northeast. The remnants were last noted south of the Aleutian Islands on October 17. At 0600 UTC on October 9, a tropical storm watch was issued for Agrihan in the northern Mariana Islands, upgraded to a warning the next day. During the storm's passage, a total of 206 mm (8.11 in) of rain was recorded on Pagan Island. Sustained winds on the island reached 58 km/h (36 mph) and gusts reached 122 km/h (76 mph), although there was no damage in the region Waves up to 7.6 m (25 ft) affected the Bonin Islands. On Iwo Jima, winds were recorded up to 160 km/h (100 mph) with gusts up to 210 km/h (130 mph). Although Soulik spent over a day near Iwo Jima, no damage was reported as a result of the storm. On October 12, a tropical disturbance that had been meandering in the Philippine Area of Responsibility was designated Tropical Depression Ompong by PAGASA. The depression slowly moved westward toward the Philippines, but wind shear from Typhoon Soulik prevented any intensification. The depression degenerated into an area of low pressure early the next day. An area of disturbed weather developed northwest of Chuuk on October 24. The disturbance moved west-northwestward over the next two days and gradually became better organized, and the Joint Typhoon Warning Center issued a Tropical Cyclone Formation Alert on the system on October 26. The system was designated Tropical Depression 22W by the JTWC later that day. The system continued to strengthen, and the JTWC upgraded it to a tropical storm on October 27. The Japan Meteorological Agency later followed suit and designated the system Tropical Storm Cimaron. The name Cimaron was submitted by the Philippines, and is a type of wild ox. The system quickly intensified, and was upgraded to a severe tropical storm by the JMA later that day. The system continued its quick intensification and was upgraded to a typhoon by both the JTWC and JMA on October 28. Further intensification occurred overnight, and the typhoon had rapidly deepened 65 hPa in 24 hours, from 985 hPa to 920 hPa, causing the JTWC to upgrade it to a 140-kn super typhoon at 9 a.m. UTC on October 29. It made landfall at about 12:30 p.m. UTC the same day on Northern Luzon. There, especially in Isabela Province, it lashed winds as much as 195 km/h and gusts as much as 230 km/h. Actually, all or parts of four provinces (Isabela, Quirino, Cagayan and Aurora) are declared under Signal No. 4 as the typhoon struck the island. Cimaron then re-intensified after crossing the island, but not to its original strength, and was expected to curve towards Hainan, instead of moving towards Vietnam as previously forecast. On November 1, the JTWC upgraded the typhoon back into a Category 3-equivalent storm, and forecast that it would make a direct impact on Hong Kong. However, prediction models showed conflicting forecasts, and Cimaron remained quasi-stationary and weakened to a severe tropical storm on November 2. Dry air entrainment caused further weakening, with the JTWC dropping it to a minimal tropical storm at 3 p.m. UTC the next day. It weakened further, upwelling itself. The JTWC issued its final warning at 3 p.m. UTC on November 4. The JMA continued advisories on Cimaron until 12 a.m. UTC on November 6, when it was downgraded to a weak tropical depression. The typhoon killed at least 19 people, many of whom drowned, and left 15 missing in the northern Philippines. It also killed a woman and her child after both are hit by a sheet of galvanized iron in Dilasag, Aurora Province, serving as the first human casualties. Further casualties happened as the typhoon passed through Luzon. Despite these, however, classes in Metro Manila were still not suspended. It also caused at least US$9 million in damage. 90% of the houses were damaged in a coastal town near where Cimaron made landfall. In the aftermath of the storm's passage across the Philippines, the Swedish International Development Cooperation Agency contributed 2.5 million Swedish krona (US$350,000) to aid efforts. An area of disturbed weather developed east of the Mariana Islands on October 31, and moved west-northwestward over the next week without any increase in organization due to an unfavorable environment, until November 6, when it encountered more favorable conditions, and the Japan Meteorological Agency declared it a tropical depression on November 8. The Joint Typhoon Warning Center issued a Tropical Cyclone Formation Alert on the system later that day, and PAGASA named the system Tropical Depression Queenie shortly after. The JTWC classified it as Tropical Depression 23W early on November 9. According to the JTWC, lack of equatorial outflow prevented rapid intensification of the system. Later that day at 12 p.m. UTC, the JMA upgraded it to a tropical storm named it Chebi. The name Jebi, the correct spelling means swallow in Korean. The JTWC and PAGASA both followed suit later that day. Early on November 10, the JMA upgraded Chebi to a severe tropical storm as it continued to move west towards the Philippines, following a similar track as Typhoon Cimaron earlier in the season. Just hours later, the JMA upgraded Chebi from severe tropical storm with 10-minute sustained winds of 55 knots to a typhoon with winds of 95 knots, with a pressure decrease of 40 hPa over three hours. The JTWC followed suit, upping Chebi from a tropical storm with 1-minute sustained winds of 55 knots to a Category 4-equivalent typhoon at 9 a.m. UTC. PAGASA raised Public Storm Warning Signal No. 4 for three provinces in Luzon, making Chebi the second storm (Typhoon Cimaron served as the first one that year.) in as many weeks to force a Signal #4. After rapidly deepening, Chebi weakened as it approached the Philippines. It made its first landfall near Casiguran, Aurora early on November 11, crossed the Lingayen Gulf and its second landfall on Barangay Lucap, Alaminos City about 8 hours later. Encountering dry air entrainment and increased vertical wind shear in the South China Sea, Chebi began to gradually weaken to a severe tropical storm on November 12. It continued to weaken, turning northwards towards Hainan, and was downgraded to a tropical storm the next day. On November 14, the JMA issued its last advisory on the dissipating tropical depression. The JTWC issued its final warning later that same day as Chebi dissipated under the strong shear. All told, the typhoon caused further casualties as well as damage caused by the earlier Typhoon Cimaron. After passing through Luzon, it left 1 dead and 10 injured. In Aurora Province, it caused floods, cutting the province's road system, as well as zero visibility, further isolating it from relief efforts. An area of disturbed weather developed southeast of Chuuk on November 24. Wind shear near the disturbance soon decreased, allowing the depression to organize a little. It was designated a tropical depression by Japan Meteorological Agency on November 25, and later that day the Joint Typhoon Warning Center started issuing warnings on the system as it moved west-northwest towards Yap. The depression strengthened because it was in an area of high sea-surface temperatures, and there were distinct cloud features of anticyclonic outflow, according to the JMA. It was upgraded to a tropical storm on the afternoon of November 26 and named Durian. The name Durian refers to a fruit, "Durio zibethinus", and was submitted to the naming list by Thailand. Moving west to west-northwestward, Durian intensified slowly. It became a severe tropical storm on November 27, and the next day it was named Reming by PAGASA when it entered the Philippine Area of Responsibility. Later on November 28, both the JMA and JTWC upgraded it to a typhoon as it continued to track towards the Philippines. A quick bout of intensification occurred on November 29, causing the JMA to upgrade the storm to 100 knots in wind intensity, and the JTWC to give it a Dvorak classification of 6.5 (127 kn) in a satellite fix. In 6 hours, Durian intensified from 90 kn 1-minute sustained winds to 125 kn winds. The JTWC then forecast a direct hit over Metro Manila later that day when it upgraded the storm to a super typhoon. PAGASA raised Public Storm Warning Signal 4, its highest warning level, over Catanduanes, Albay, Camarines Norte and Camarines Sur. It was the third time in 2006, and the third time in a row, that PAGASA raised Signal #4. Durian began to weaken slightly as it approached land, undergoing an eyewall replacement cycle, but quickly regained peak strength. PAGASA claimed that the storm made landfall on the morning of November 30 over southern Catanduanes, although the JMA and JTWC did not recognize this landfall. Durian then made another landfall after crossing the Lagonoy Gulf in northeastern Albay. After weakening due to interaction with land, Durian was downgraded back to a typhoon by the JTWC. The storm continued to move west, making landfalls on the Bondoc Peninsula in Quezon, on Marinduque and finally on Oriental Mindoro before exiting to the South China Sea. Encountering dry air entrainment and vertical wind shear, Durian weakened slightly at first, but slowly began to reorganise and restrengthen as it neared Vietnam. Durian began to turn slightly southwest towards Nha Trang and Ho Chi Minh City on December 3. Eventually, Durian began to weaken again, and by December 4, the JMA downgraded it to a severe tropical storm. The storm maintained intensity as it skirted the Vietnamese coast moving southwest. After a brief second stint at typhoon strength, Durian finally made landfall in Bến Tre Province on December 5. The system rapidly weakened over land, and the JMA downgraded it to a tropical storm. The JMA and JTWC issued their final advisories later that day as Durian emerged into the Gulf of Thailand as a weak tropical depression. The remnants of Durian then crossed the coast of southern Thailand as it moved into the Bay of Bengal. The storm killed at least 720 in the Philippines. The most damage occurred in Albay Province where the storm created mudslides of volcanic ash and boulders off Mayon Volcano. The Padang barangay of Legazpi City was severely affected with a large portion of the town covered in mud up to houses' roofs. At least 81 people have died and 16 people are missing in Vietnam from the storm. On December 8, the JMA upgraded Utor to a severe tropical storm. It intensified further and was upgraded to a typhoon by the JMA on the morning of December 9, with PAGASA and JTWC doing the same. The storm made landfall shortly after noon local time the same day. After crossing the Philippines, Utor took a track similar to Typhoon Chebi in November, first moving northwest then threatening to take aim at Hong Kong. It restrengthened to an 85-kn typhoon, before it slowed as it tracked in a weak steering environment within a weakness in the subtropical ridge. It then weakened as wind shear increased and dry air entrainment occurred. The JMA downgraded it to a severe tropical storm on December 13, and to a tropical storm the same day. The next day the JTWC downgraded the storm to a tropical storm and issued its last advisory. The 2006 ASEAN and East Asia Summit, originally scheduled to start December 10, was put back a month due to the storm. Typhoon Utor killed at least 78 people and left 49 others missing in the Philippines. Damages from the typhoon were estimated at $1.9 million (2006 USD). Typhoon Utor was blamed for heavy rains of up to 350 mm within 24 hours in southern Peninsular Malaysia, specifically Johor, Negeri Sembilan, Melaka and Pahang, causing massive floods within the southern region on December 18, 2006, which was considered as the worst in the Malaysian southern region history. However, there were also reports a few days earlier that adverse weather was not to be blamed on the typhoon. The worst-affected areas were Segamat and Kota Tinggi, where both towns were totally inaccessible by land after all main roads leading to those towns were all flooded. Until December 24, 2006, the floods had claimed 8 lives. On December 16, the Japan Meteorological Agency started issuing public bulletins on a tropical depression southwest of Guam. The Joint Typhoon Warning Center initiated warnings on Tropical Depression 26W the next day, despite having not issued a Tropical Cyclone Formation Alert. The system was upgraded to a tropical storm by the JMA and named Trami, which is a kind of rose tree. This name was submitted by Vietnam. The storm moved west-northwest rapidly towards the Philippines, but struggled against wind shear and an approaching cold front. Entering the PAGASA Area of Responsibility on December 18 as it maintained minimal tropical storm intensity, it was named Tomas. The JTWC issued its final warning later that day, having never upgraded the storm to tropical storm strength, citing no indication of a significant low-level circulation centre. On December 19, the JMA downgraded the storm to a tropical depression and issued its last public bulletin as the storm dissipated over water. On March 7, the JMA had upgraded a low-pressure area to a tropical depression formed by the remnants of 01W to the southeast of Mindanao, Philippines. During the next day, the system moved overland and made landfall over in Davao. The system emerged to the Sulu Sea, nearing Palawan until it weakened back into a low-pressure are on March 10. On March 11, the same system emerged to the South China Sea as the JMA had re-upgraded it back to a tropical depression. Although the system had experienced shear and became an exposed system, the depression fully dissipated late on March 12. On July 3, both the China Meteorological Administration (CMA) and the JMA had identified a tropical depression about 200 km south of Sanya, Hainan. The depression moved northwest and made landfall a in Hainan on the same day. The depression made its second landfall over in the border of northern Vietnam and China as it rapidly deteriorated and absorbed by a front on July 4. Early on July 21, the CMA classified it as a tropical depression. The CMA issued its final warning on July 22 as it started to weaken rapidly. The system was absorbed by Typhoon Kaemi and fully dissipated on July 25. The JMA only classified the system as a low-pressure area throughout its lifetime. On July 28, a tropical depression had rapidly organized and persisted over in the Gulf of Tonkin and made landfall in the same location as the previous system at its peak strength with a pressure of 998 mbar. The system moved over land and fully dissipated on July 29. On September 13, two tropical depressions were monitored by the JMA. The first one persisted just south of Hong Kong and dissipated later on the same day. The second system formed from a stationary front near Taiwan and moved northwards. By September 15, the system dissipated while making landfall over in South Korea. A trio of tropical depressions were also monitored by the JMA during late October. The first developed on October 21 about north of the Mariana Islands. The depression moved stationary until its circulation became exposed due to shear on October 23. The other two systems were also monitored very briefly by the JMA during October 22. One in the South China Sea as it moved westwards and fully dissipated six hours later, where its remnants made landfall in Vietnam during the next day; whilst the other persisted over in the Philippine Sea also bringing rainfall to Luzon during October 25, just before the arrival of Typhoon Cimaron. During the season 22 tropical storms developed in the Western Pacific and each one was named by the JMA, when the system was judged to have 10-minute sustained windspeeds of 65 km/h (40 mph). The JMA selected the names from a list of 140 names, that had been developed by the 14 members nations and territories of the ESCAP/WMO Typhoon Committee. After the season the Typhoon Committee retired the names Chanchu, Bilis, Saomai, Xangsane and Durian. They were replaced with Sanba, Maliksi, Son-Tinh, Leepi and Mangkhut, respectively. Also, after this season the names Kaemi and Chebi changed to Gaemi and Jebi, because it was found out that those names were misspellings. During the season PAGASA used its own naming scheme for the 19 tropical cyclones, that either developed within or moved into their self-defined area of responsibility. This was the same list than used in 2002, except Domeng, Ester, Glenda, Henry, Katring, Luis, Paeng, Queenie, Reming, Seniang, Tomas, Waldo, Chito, Felino, Harriet and Indang, which replaced Dagul, Espada, Gloria, Hambalos, Kaka, Lagalag, Paloma, Quadro, Rapido, Sibasib, Tagbanwa, Wisik, Ciriaco, Forte, Hunyango and Itoy. The names not retired from this list to be used again in 2010. The neas Although the name Gloria from 2002 was retired and replaced with Glenda, as it was the name of the incumbent Philippine president at that time. After the season, PAGASA had stated that the names Milenyo and Reming will be retired as they had caused over Php1 billion in damages and over 300 fatalities. They were subsequently replaced on the list with Mario and Ruby. Both names, however, were retired after the 2014 season, being replaced by Maymay and Rosita respectively. This table summarizes all the systems that developed within or moved into the North Pacific Ocean, to the west of the International Date Line during 2006. The tables also provide an overview of a systems intensity, duration, land areas affected and any deaths or damages associated with the system. ^ a b Saunders, Mark; Lea, Adam (January 10, 2007). Summary of 2006 NW Pacific Typhoon Season and Verification of Authors' Seasonal Forecasts (PDF) (Report). Tropical Storm Risk Consortium. ^ a b c Saunders, Mark; Lea, Adam (May 5, 2006). May Forecast Update for Northwest Pacific Typhoon Activity in 2006 (PDF) (Report). Tropical Storm Risk Consortium. ^ a b Saunders, Mark; Lea, Adam (March 7, 2006). Extended Range Forecast for Northwest Pacific Typhoon Activity in 2006 (PDF) (Report). Tropical Storm Risk Consortium. ^ Saunders, Mark; Lea, Adam (June 7, 2006). June Forecast Update for Northwest Pacific Typhoon Activity in 2006 (PDF) (Report). Tropical Storm Risk Consortium. ^ a b Saunders, Mark; Lea, Adam (July 5, 2006). July Forecast Update for Northwest Pacific Typhoon Activity in 2006 (PDF) (Report). Tropical Storm Risk Consortium. ^ a b Saunders, Mark; Lea, Adam (August 4, 2006). August Forecast Update for Northwest Pacific Typhoon Activity in 2006 (PDF) (Report). Tropical Storm Risk Consortium. ^ Gary Padgett (April 25, 2006). "Monthly Tropical Weather Summary for January 2006". Typhoon 2000. ^ "Cold & Warm Episodes by Season". NOAA. July 2006. Retrieved November 4, 2016. ^ Gary Padgett (November 26, 2006). "Monthly Tropical Weather Summary for August 2006". Typhoon 2000. ^ Gary Padgett (January 28, 2007). "Monthly Tropical Weather Summary for September 2006". Typhoon 2000. ^ a b c d e f Gary Padgett (February 21, 2007). "Monthly Tropical Weather Summary for October 2006". Typhoon 2000. ^ Gary Padgett (April 25, 2006). "Monthly Tropical Weather Summary for January 2006". Typhoon 2000. Archived from the original on February 24, 2009. Retrieved February 17, 2009. ^ "Navy/NRL Tropical Cyclone Page". Nrlmry.navy.mil. September 23, 2010. Archived from the original on August 29, 2012. Retrieved October 19, 2010. ^ a b c d Kevin Boyle. "Monthly Global Tropical Cyclone Summary May 2006". Gary Padgett. Retrieved June 22, 2014. ^ a b c d e Annual Report on Activities of the RSMC Tokyo: Typhoon Center 2006 (PDF) (Report). Japan Meteorological Agency. 21. Retrieved June 22, 2014. ^ a b Kenneth R. Knapp; Michael C. Kruk; David H. Levinson; Howard J. Diamond; Charles J. Neumann (2010). 2006 Chanchu (2006128N09138). The International Best Track Archive for Climate Stewardship (IBTrACS): Unifying tropical cyclone best track data (Report). Bulletin of the American Meteorological Society. Archived from the original on March 5, 2016. Retrieved June 22, 2014. ^ "Seoul to go ahead with drills despite threats of war". Today.reuters.co.uk. February 9, 2009. Archived from the original on December 20, 2010. Retrieved October 19, 2010. ^ Ho Binh Minh (May 20, 2006). "Asia typhoon kills 104, hundreds missing in Vietnam". ReliefWeb. Reuters. Retrieved June 26, 2014. ^ "HKO Warnings/Signals Database". Hko.gov.hk. Retrieved October 19, 2010. ^ "Hong Kong's First FREE English Newspaper". The Standard. Hong Kong. Archived from the original on May 22, 2011. Retrieved October 19, 2010. ^ "Digital Typhoon: List of weather charts on June 24, 2006 (Sat)". agora.ex.nii.ac.jp. Retrieved April 10, 2018. ^ "Trmm Sees Typhoon Kaemi". Trmm.gsfc.nasa.gov. July 21, 2006. Retrieved October 19, 2010. ^ "Flag raising ceremony cancelled". Info.gov.hk. Retrieved October 19, 2010. ^ "World Updates | The Star Online". Thestar.com.my. Archived from the original on March 9, 2012. Retrieved December 8, 2012. ^ "Xinhua – English". News.xinhuanet.com. August 6, 2006. Retrieved October 19, 2010. ^ a b "台風0607号 (0621 Maria)" (PDF) (in Japanese). Japan Meteorological Agency. 2007. Retrieved July 23, 2013. ^ "Tropical Storm 09W 2006 (Maria) Best Track" (.TXT). Joint Typhoon Warning Center. United States Navy. 2007. Retrieved July 23, 2013. ^ Staff Writer (August 10, 2006). "Typhoon Saomai to skirt northern Taiwan today". The China Post. Retrieved February 16, 2009. ^ Gary Padgett; Kevin Boyle; Simon Clarke (November 26, 2006). "Monthly Tropical Weather Summary for August 2006" (Report). Typhoon 2000. Retrieved February 16, 2009. ^ 気象災害報告 (2006-662-07) (in Japanese). National Institute of Informatics. 2006. Retrieved August 19, 2010. ^ 気象災害報告 (2006-636-07) (in Japanese). National Institute of Informatics. 2006. Retrieved August 19, 2010. ^ "Vietnamese Dictionary and Translation". VDict.com. Retrieved October 19, 2010. ^ a b c Joint Typhoon Warning Center (2007). "Tropical Storm 10W (Bopha) Best Track". Retrieved August 2, 2009. ^ Staff Writer (August 11, 2006). "Tropical Storm Bopha". Earthweek. Retrieved August 2, 2009. ^ "Two children killed in RP landslide". The China Post. Taiwan (ROC). Associated Press. August 9, 2006. Retrieved August 2, 2009. ^ Yu-huay Sun; Theresa Tang (August 8, 2006). "Taiwan Issues Alert as Tropical Storm Bopha Nears (Update2)". Bloomberg News. Retrieved August 2, 2009. ^ Staff Writer (August 9, 2006). "Island prepares for storm Bopha; heavy rain likely". The China Post. Taiwan (ROC). Retrieved August 2, 2009. ^ Hong Kong Observatory (2007). "HKO Annual Tropical Cyclone Report: STS Bopha 2006". World Meteorological Organization. Retrieved August 2, 2009. ^ Staff Writer (July 31, 2007). "Tropical Storm Bopha rainfall amounts in Hong Kong". Hong Kong Observatory. Retrieved August 2, 2009. ^ Staff Writer (July 31, 2007). "Tropical Storm Bopha Winds in Hong Kong". Hong Kong Observatory. Retrieved August 2, 2009. ^ Staff Writer (July 31, 2007). "Tropical Storm Bopha storm surge in Hong Kong". Hong Kong Observatory. Retrieved August 2, 2009. ^ "Hickam Airman To Evacuate Hundreds From Wake Island". Khnl.com. Retrieved October 19, 2010. ^ Angela Hutti (2006). "Storm on the Bering Sea". KTVA 11. Archived from the original on September 27, 2007. Retrieved September 8, 2006. ^ Gary Padgett; Karl Haorau; Kevin Boyle; Simon Clarke (January 28, 2007). "Monthly Global Tropical Cyclone Summary – September 2006" (Report). Typhoon 2000. Retrieved July 22, 2013. ^ "Thousands trapped by typhoon". News24. September 27, 2006. Archived from the original on September 30, 2007. Retrieved March 20, 2012. ^ "Typhoon kills 2 in Vietnam". CNN. October 1, 2006. Archived from the original on October 5, 2006. Retrieved March 20, 2012. ^ "Annual Report on Activities of the RSMC Tokyo: Typhoon Center 2006" (PDF). Japan Meteorological Agency. November 10, 2007. ^ a b c d "JMA Annual Tropical Cyclone Report: 2006" (PDF). Japan Meteorological Agency. 2007. Retrieved February 16, 2009. ^ a b c "JTWC Best Track for Typhoon 21W (Soulik)". Joint Typhoon Warning Center. 2007. Retrieved February 18, 2009. ^ Middlebrooke (October 9, 2006). "Tropical Depression 21W Advisory Number 2". Unisys Corporation. Retrieved February 18, 2009. ^ Marn (October 10, 2006). "Tropical Storm Soulik (21W) Intermediate Advisory Number 7A". Unisys Corporation. Retrieved February 18, 2009. ^ Ziobro (October 11, 2006). "Tropical Storm Soulik (21W) Local Statement". Unisys Corporation. Retrieved February 18, 2009. ^ Staff Writer (October 15, 2006). "Soulik affecting the Bonin Islands, Heavy Rains in Mexico". Weather Matrix. Archived from the original on February 22, 2013. Retrieved February 18, 2009. ^ Staff Writer (October 14, 2006). "Soulik continuing to affect Iwo Jima". Weather Matrix. Archived from the original on January 2, 2014. Retrieved February 18, 2009. ^ Gary Padgett (February 21, 2007). "Monthly Tropical Weather Summary for October 2006". Typhoon 2000. Retrieved February 18, 2009. ^ "(Update) Super typhoon 'Paeng' rips Isabela province – Nation – Official Website of GMA News and Public Affairs – Latest Philippine News – BETA". GMANews.TV. Archived from the original on December 9, 2008. Retrieved October 19, 2010. ^ "Paeng 2006". Gmanews.tv. October 29, 2006. Archived from the original on May 22, 2011. Retrieved October 19, 2010. ^ "Typhoon 'Paeng' claims first casualties – Nation – Official Website of GMA News and Public Affairs – Latest Philippine News – BETA". GMANews.TV. Retrieved October 19, 2010. ^ "Typhoon 'Paeng' weakens but casualties rise; 3 dead, 3 hurt – Nation – Official Website of GMA News and Public Affairs – Latest Philippine News – BETA". GMANews.TV. Retrieved October 19, 2010. ^ "Classes in Metro Manila not suspended despite typhoon – Nation – Official Website of GMA News and Public Affairs – Latest Philippine News – BETA". GMANews.TV. Retrieved October 19, 2010. ^ "News: Southeast Asia: Typhoon Cimaron – Oct 2006, Toll from typhoon Cimaron rises to 19 in Philippines". Reliefweb.int. November 1, 2006. Retrieved October 19, 2010. ^ "Contributions: Southeast Asia: Typhoon Cimaron – Oct 2006, Sida support to nearly two million Asians affected by typhoon, Press Releases: Southeast Asia: Typhoon Xangsane – Sep 2006, Sida support to nearly two million Asians affected by typhoon". Reliefweb.int. October 29, 2006. Retrieved October 19, 2010. ^ "(Update) 'Queenie' leaves RP: 1 dead, 10 injured – Nation – Official Website of GMA News and Public Affairs – Latest Philippine News – BETA". GMANews.TV. Archived from the original on May 22, 2011. Retrieved October 19, 2010. ^ "Floods hamper relief work in Aurora – Nation – Official Website of GMA News and Public Affairs – Latest Philippine News – BETA". GMANews.TV. Retrieved October 19, 2010. ^ "Zero visibility now keeping relief goods from Aurora – Nation – Official Website of GMA News and Public Affairs – Latest Philippine News – BETA". GMANews.TV. Retrieved October 19, 2010. ^ "Situation Reports: Southeast Asia: Typhoon Durian – Dec 2006, Philippines: NDCC media update – Typhoon "Reming" (Durian) 13 Dec 2006". Reliefweb.int. December 13, 2006. Retrieved October 19, 2010. ^ "Press Releases: Southeast Asia: Typhoon Durian – Dec 2006, Devastating typhoon hits the Philippines and Vietnam". Reliefweb.int. December 11, 2006. Retrieved October 19, 2010. ^ "Press Releases: Southeast Asia: Typhoon Durian – Dec 2006, Viet Nam: NDMP Durian typhoon damage update 8 Dec 2006". Reliefweb.int. December 8, 2006. Retrieved October 19, 2010. ^ "The official site of 12th ASEAN SUMMIT: Cebu, Philippines". 12thaseansummit.org.ph. Retrieved October 19, 2010. ^ "Philippines postpones Asean talks". BBC News. December 8, 2006. Retrieved April 22, 2010. ^ "Situation Reports: Philippines: Typhoon Utor – Dec 2006, Philippines: NDCC media update – Typhoon "Seniang" (Utor) 15 Dec 2006". Reliefweb.int. Retrieved October 19, 2010. ^ "ReliefWeb ť Document ť CWS Situation Report: Typhoon Utor/Philippines". Reliefweb.int. July 6, 2001. Retrieved October 19, 2010. ^ "Seas too choppy for small vessels". Thestar.com.my. December 14, 2006. Archived from the original on May 21, 2011. Retrieved October 19, 2010. ^ "Digital Typhoon: List of weather charts on March 07, 2006 (Tue)". agora.ex.nii.ac.jp. Retrieved April 10, 2018. ^ "Digital Typhoon: List of weather charts on March 08, 2006 (Wed)". agora.ex.nii.ac.jp. Retrieved April 10, 2018. ^ "Digital Typhoon: List of weather charts on March 10, 2006 (Fri)". agora.ex.nii.ac.jp. Retrieved April 10, 2018. ^ "Digital Typhoon: List of weather charts on March 11, 2006 (Sat)". agora.ex.nii.ac.jp. Retrieved April 10, 2018. ^ "Digital Typhoon: List of weather charts on March 12, 2006 (Sun)". agora.ex.nii.ac.jp. Retrieved April 10, 2018. ^ "Digital Typhoon: List of weather charts on July 04, 2006 (Tue)". agora.ex.nii.ac.jp. Retrieved April 10, 2018. ^ "Digital Typhoon: List of weather charts on July 28, 2006 (Fri)". agora.ex.nii.ac.jp. Retrieved April 10, 2018. ^ "Digital Typhoon: List of weather charts on July 29, 2006 (Sat)". agora.ex.nii.ac.jp. Retrieved April 10, 2018. ^ "Digital Typhoon: List of weather charts on September 15, 2006 (Fri)". agora.ex.nii.ac.jp. Retrieved April 10, 2018. ^ "Digital Typhoon: List of weather charts on October 21, 2006 (Sat)". agora.ex.nii.ac.jp. Retrieved April 10, 2018. ^ "Digital Typhoon: List of weather charts on October 23, 2006 (Mon)". agora.ex.nii.ac.jp. Retrieved April 10, 2018. ^ a b "Philippine Tropical Cyclone Names". Pagasa.dost.gov.ph. January 7, 2008. Archived from the original on April 20, 2008. Retrieved October 19, 2010.